The RYA Competent Crew is the starting point for your sailing. The course will introduce you to all key aspects of sailing a yacht. At the end of the week you will have become a competent and confident member of the crew. The course is designed to provide fun and enjoyment in a safe and reassuring environment. During the RYA Competent Crew course you will be taught all the fundamentals of crewing a yacht. 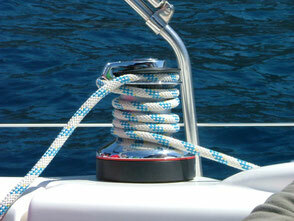 Knots, nautical terms, sail handling and helming just to start with. You will also learn how to fix a position on a chart and how to take an active part in all manoeuvres. This includes mooring, anchoring, navigating etc. During the course you will spend the week aboard the yacht, visiting many beautiful bays and harbours in Croatia. With a maximum of 5 students per yacht, your instructors can devote plenty of time to your needs and focus the program on the areas you need most. Safety is paramount in all RYA courses. You will learn how to operate flares, lifejackets, safety harnesses, liferafts. You will assist the manoeuvres to recover a man overboard and participate in at least four hours of night time sailing. At the end of the course you will be awarded the RYA Competent Crew Certificate! You can book directly online by first choosing your preferred dates below and then clicking the 'Add to cart' button. If you prefer, you can also give us a call or send us an email with your desired dates and we will get back to you with a confirmation. Once you book the course, we will send you the RYA Handbook so you can start browsing through. We will also send you the detailed joining instructions.